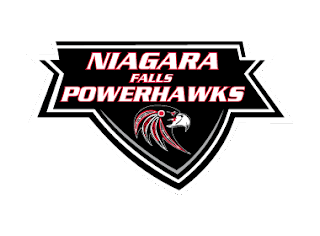 After what seems a very long break, the Niagara Falls PowerHawks will be back in action at the Hyde Park Ice Pavilion for a trio of games this weekend. They will face off against rival Roc City Royals on Friday evening, with game time set for 7:00pm. For Saturday and Sunday, the PowerHawks will play against the Binghamton Junior Senators. Times for those games are 6:00pm and 1:00pm, respectively. With the recent demise of the Jersey Shore Wildcats, the Niagara Falls PowerHawks have jumped into second place in the Northeast Division. They trail Binghamton by 16 points for first place, and sit only 4 points ahead of Oswego and Skylands. Niagara Falls has several games in hand on both teams chasing them in the standings. Next weekend, the Niagara Falls will host a pair of games against the Oswego Stampede. Those games will be held at Dwyer Arena at Niagara University rather than at the Hyde Park Ice Pavilion. The time for Saturday’s game will be 7:30pm, while the tilt on Sunday will get underway at 8:05am.